NB: this podcast was recorded in December 2017 when Re Sew was still in its pilot phase. Since then, the project has gone from strength to strength – it’s life has been extended and its social media presence expanded! Check out the Facebook page for updates and to find short videos demonstrating quick and easy sewing projects that you can try at home! Vinnies Re Sew is an up-cycling, sustainable sewing initiative focused on re-purposing some of the donated textiles that cannot be sold in Vinnies Op Shops across the Wellington Region. These textiles are bagged up and brought to Vinnies Kilbirnie where they’re sorted and then transformed into new products, repaired for resale or passed onto other community group projects. The Vinnies Re Sew programme not only saves textiles from going to waste, it’s also a work experience programme that invites participants from Vinnies’ welfare services, new immigrants and refugees. The opportunities the programme provides to create, and to share and learn skills associated with sewing and crafts, is rewarding, fulfilling and brings generations and communities together. In this podcast we talk with Caroline (Re Sew Coordinator) and Millie (Vinnies’ Marketing Manager), to hear more about the Vinnies Re Sew project, how it came about, and the benefits that come from breathing new life into materials otherwise destined for landfill. Our conversation also delved into what Vinnies Re Sew shows us about the wasteful habits our society has constructed when it comes to textiles, and the little things we can do to change our own approach to clothing and turn the tide on the sea of textiles we currently send to landfill and our country’s op shops every year. Awesome podcast!! Making people aware of just how much they get rid of to places like Op shops and landfill. I organise and volunteer at our local Op shop and have seen with my own eyes the amount of clothing some people donate – some like brand new and then others beyond it which we cut into rags (if absorbent enough) for sale to a local garage. Keep up the good work. I would love to come and see what you do one day. Thanks Mia – it is quite alarming the issue with waste textiles. Also alarming that this massive waste issue doesn’t seem to have translated to the high streets where major brands continue to churn out huge quantities of low-quality clothing… but hopefully change is afoot. Op Shops are amazing places for filling our wardrobes and we’re so grateful for the mahi you all do across the country. If only we could all be a bit more careful of what we consume and then dump at your doorsteps. 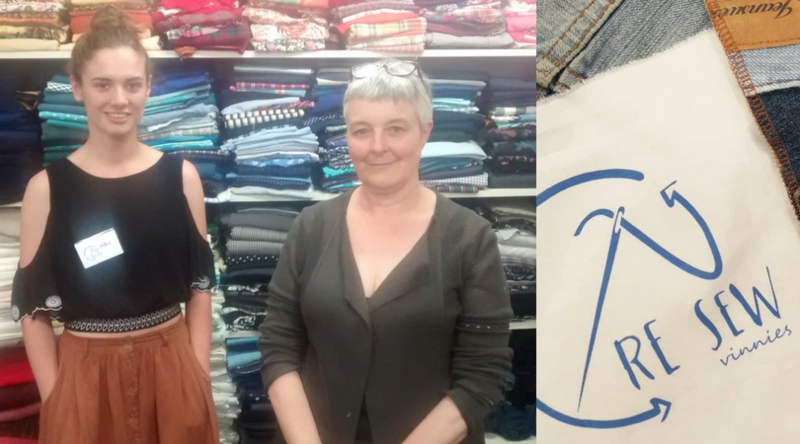 In some ways though, this waste clothing is a resource and we love what Re Sew has done to turn this around and breathe new life and purpose into these fabrics – inspiration for others too, we hope 🙂 All the best and hope to cross paths somewhere in NZ!